Eliad Inbar, Tangiblee | Be Like Peter. 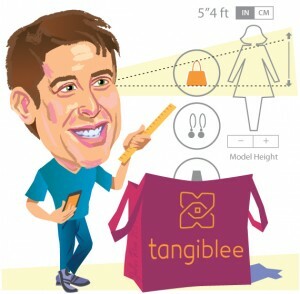 Eliad Inbar is the co-founder of Tangiblee. He came to Chicago last summer after Tangiblee was accepted to the 2014 class of Tech Stars. Eliad believes he is a lucky guy in life and that people can affect their luck by being open to and seizing opportunities – such as Tangiblee. The idea first came about when Eliad was buying earrings for his wife online. When he actually got them they were much bigger than he expected – so much so that he did not keep them. He encountered more and more stories of people buying a variety of items online that were not the right size or fit, and as a result, the concept of Tangiblee was born. Tech Stars wasn’t initially on Tangiblee’s initial radar, but a friend introduced them to it and they decided to just go for it. They did all their applications and interviews remotely from Israel via Google Hangouts. “Most of the big things that happen to you in your life – you don’t plan them. I didn’t think it was going to be this fast. It’s been a life changing event. It was a pretty easy decision to come here. These are opportunities we couldn’t have gotten in Israel – business development, investor exposure, trying what we do in a big market. For Tangiblee, it has been about getting your network to take a bet and keeping them happy about the bet they are taking. “Take things in proportion. That’s something I still need to work on. Another thing you learn is just to get used to getting out of your comfort zone on a daily basis, even an hourly basis. If you don’t do that you’re not going to enjoy the ride and you have to enjoy the ride.